"Weeks of the Federal Republic of Germany in the Republic of Belarus" - XJAZZ Minsk Edition. 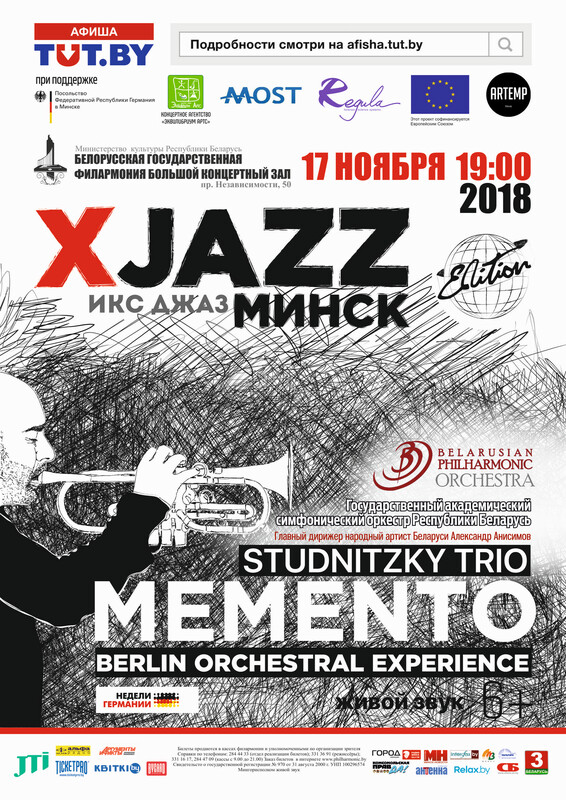 The world famous jazz ensemble Studnitzky Trio together with the State Academic Symphony Orchestra of the Republic of Belarus will present the programme “MEMENTO” on the stage of the Belarusian State Philharmonic Society on 17 November in the framework of the premiere XJAZZ Minsk Edition. The soloist and author of the project "MEMENTO" Sebastian Studnitzky is German composer, trumpet player and pianist, who is called the "esthete of sound" is known not only as a high-class musician and soloist of the legendary fusion band Mezzoforte. During his career, he has collaborated with Stevie Wonder, Sting, Jazznova Live, Nils Landgren, Dominic Miller and other legends of the world scene. In 2014 Sebastian Studnitzky founded and became the music director of the XJAZZ festival Berlin, which quickly gained international fame. Sebastian Studnitzky became one of the brightest representatives of the alternative jazz movement in Europe combining minimalist classics, jazz and electronic music in his work with the author's improvisations of trumpet, percussion and piano. “Piano or trumpet? Orchestra or small ensemble? Electronic or classical music? Jazz or pop? – Sebastian Studnitzky can’t and isn’t taken to decide. His new album “Memento” proves once again that this is not really necessary. ” (WDR 3). The three-day festival XJAZZ Minsk Edition, which take place in the Belarusian capital under the auspices of "Weeks of the Federal Republic of Germany in the Republic of Belarus" for the first time, will end with the performance of the programme “MEMENTO”. This event was made possible by the support of the Embassy of the Federal Republic of Germany, the European Union project "MOST", the company "Regula", the enthusiasm of the founders of the largest European jazz festival XJAZZ and Belarusian co-organizers - the concert agency Equilibrium Arts and the international project ARTEMP. 16:00 – Interactive music program "Jazz for the youngest"
Jazz trio of Sebastian Studnitzky (Berlin) and State Academic Symphony Orchestra of the Republic of Belarus.